Tumor-induced myeloid-derived suppressor cells (MDSC) contribute to immune suppression in tumor-bearing individuals and are a major obstacle to effective immunotherapy. Reactive oxygen species (ROS) are one of the mechanisms used by MDSC to suppress T cell activation. Although ROS are toxic to most cells, MDSC survive despite their elevated content and release of ROS. NF erythroid 2–related factor 2 (Nrf2) is a transcription factor that regulates a battery of genes that attenuate oxidative stress. Therefore, we hypothesized that MDSC resistance to ROS may be regulated by Nrf2. To test this hypothesis, we used Nrf2+/+ and Nrf2−/− BALB/c and C57BL/6 mice bearing 4T1 mammary carcinoma and MC38 colon carcinoma, respectively. Nrf2 enhanced MDSC suppressive activity by increasing MDSC production of H2O2, and it increased the quantity of tumor-infiltrating MDSC by reducing their oxidative stress and rate of apoptosis. Nrf2 did not affect circulating levels of MDSC in tumor-bearing mice because the decreased apoptotic rate of tumor-infiltrating MDSC was balanced by a decreased rate of differentiation from bone marrow progenitor cells. These results demonstrate that Nrf2 regulates the generation, survival, and suppressive potency of MDSC, and that a feedback homeostatic mechanism maintains a steady-state level of circulating MDSC in tumor-bearing individuals. The microenvironment of solid tumors (tumor microenvironment [TME]) is frequently inflamed and oxidatively stressed owing to hypoxia, the presence of reactive oxygen species (ROS), and multiple proinflammatory mediators (1). Therefore, cells in this environment must mitigate oxidative radicals to survive. Tumor cells survive this environment by having elevated levels of stabilized NF erythroid 2–related factor 2 (Nrf2), which enhances tumor cell proliferation and resistance to chemotherapy and promotes tumor growth (2–4). Nrf2 is a basic leucine zipper transcription factor that is ubiquitously expressed in many tissues and cells (2, 5–7). Under normal redox conditions, Nrf2 is restricted to the cytoplasm by Kelch-like ECH-associated protein 1 (Keap1), which promotes the polyubiquitination of Nrf2, leading to its destruction by the 26s proteasome (8–12). Oxidative stress stabilizes Nrf2 by oxidizing key thiol residues on Keap1, which causes conformational changes of Keap1 that prevent Nrf2 polyubiquitination and subsequent degradation (13–15). Nrf2 can also be stabilized through direct phosphorylation by kinases involved in inflammatory signaling cascades (e.g., KRAS, MYC, PKC, ERK, MAPK, and p38) (16–21). Once stabilized, Nrf2 translocates to the nucleus where it heterodimerizes with other basic leucine zipper transcription factors, including Jun (c-Jun, Jun-D, and Jun-B) and small Maf (MafG, MafK, and MafF) (22–27), and it upregulates genes containing an antioxidant response element in their promoter (28–30). Activation of these antioxidant genes quenches oxidative stress and promotes detoxification, thereby protecting cells from oxidative toxicity. Cells of the immune system are also present in the TME and must protect themselves against oxidative radicals. Myeloid-derived suppressor cells (MDSC) are immature myeloid cells that suppress T cell activation and proliferation (31), perturb naive T cell trafficking to lymph nodes (32), impair NK cell cytotoxicity (33), induce T regulatory cells (34), and skew macrophages to a tumor-promoting (type II) phenotype (35). MDSC are present in most solid tumors where they contribute to oxidative stress by their production of superoxide (36). Superoxide produced by MDSC rapidly reacts with a large number of molecules to form ROS such as H2O2, hydroxyl radical, hypochlorous acid, and peroxynitrite, which damage proteins, lipids, and nucleic acids, enhance inflammation, and promote apoptosis. H2O2 reduces T cell expression of the CD3ζ chain, thereby limiting the ability to become activated and mediate antitumor immunity (37, 38). Nitration/nitrosylation of TCRs (39) and MHC class I molecules (40) by peroxynitrite disrupts T cell–tumor Ag interactions and renders tumor cells resistant to CTL-mediated lysis. Despite their high intracellular content of ROS and their secretion of ROS, which constantly exposes them to oxidative stress, MDSC accumulate and function in tumor-bearing patients and animals. Given that tumor cells are protected from oxidative stress by Nrf2, we hypothesized that Nrf2 may also protect MDSC from oxidative stress. To elucidate the role of Nrf2 in MDSC, we examined the survival time of tumor-bearing BALB/c and C57BL/6 Nrf2+/+ and Nrf2−/− mice, as well as the generation, survival, suppressive potency, and tumor infiltration of MDSC in these mice. Wild-type tumor-bearing mice have a decreased survival time and have more tumor-infiltrating and more suppressive MDSC compared with Nrf2-deficient mice. The increase in tumor-infiltrating MDSC is the result of a reduced rate of MDSC apoptosis. However, Nrf2 does not affect the level of MDSC in the periphery because a homeostatic regulatory mechanism increases MDSC generation from bone marrow progenitor cells. BALB/c Nrf2+/+, BALB/c Nrf2−/−, C57BL/6 Nrf2+/+, and C57BL/6 Nrf2−/− mice were bred in the University of Maryland Baltimore County animal facility from stock obtained from The Jackson Laboratory (C57BL/6 and BALB/c) or provided by Dr. Masayuki Yamamoto (RIKEN, Japan; BALB/c Nrf2+/−) and Dr. Shyam Biswal (Johns Hopkins School of Public Health; C57BL/6 Nrf2−/−). BALB/c Nrf2−/− mice were generated from BALB/c Nrf2+/− × BALB/c Nrf2+/− mice. BALB/c Nrf2−/− and Nrf2+/+ offspring were identified by PCR typing (Supplemental Fig. 1A, 1B). DNA was isolated from pups (Qiagen, QIAamp DNA blood mini kit, per the manufacturer’s protocol) and amplified using primers specific to Nrf2 and lacZ under the following conditions: 94°C melting for 30 s, 56°C annealing for 30 s, 72°C extension for 1 min, for 30 cycles. Homozygous knockouts have a 400-kb band, heterozygotes have 400- and 734-kb bands, and homozygous wild-type mice have a 734-kb band. BALB/c Nrf2+/+ littermates from these matings served as controls. C57BL/6 Nrf2−/− mice were generated by crossing C57BL/6 Nrf2−/− × C57BL/6 Nrf2−/− mice. Nrf2 deficiency was further verified by quantitative PCR analysis of glutamate-cysteine ligase (modifier subunit), heme oxygenase 1, catalase, and NADPH dehydrogenase (quinone 1), genes that are regulated by Nrf2 (Supplemental Fig. 1B, 1C). MDSC (107) from 4T1-bearing Nrf2+/+ or Nrf2−/− mice were suspended in IMDM supplemented with 10% fetal clone I (Thermo Scientific, Waltham, MA), 1% penicillin-streptomycin, 1% GlutaMAX, and 0.1% gentamicin and plated in 35-mm petri dishes in the presence of tert-butylhydroquinone (50 μM; Sigma-Aldrich, St. Louis, MO) or vehicle control (DMSO). Cultures were incubated for 6 h (37°C, 5% CO2) and harvested. RNA was isolated with TRIzol reagent (Thermo Fisher, Grand Island, NY) and chloroform extraction. cDNA was synthesized using a Maxima first-strand cDNA synthesis kit (Thermo Fisher) as per the manufacturer’s protocol. Quantitative PCR was performed using KiCqStart SYBR Green qPCR ReadyMix (Sigma-Aldrich) with 100 nM forward and reverse primers (Supplemental Fig. 1B) on a CFX96 real-time system (Bio-Rad, Hercules, CA) under the following conditions: 95°C melting for 10 s, 57°C annealing/extension for 30 s, for 40 cycles. Data were analyzed using CFX Manager (Bio-Rad), and Nrf2-regulated genes were normalized to the housekeeping gene L32 by the ΔCT method. BALB/c-derived 4T1 mammary carcinoma and C57BL/6-derived MC38 colon carcinoma were maintained as described (41) and have been in the authors’ laboratory for >15 and 8 y, respectively. 4T1 cells were originally obtained from Dr. Fred Miller (Karmanos Cancer Center) and MC38 cells were from Dr. Dmitry Gabrilovich (Wistar Institute). Cell lines were routinely checked for mycoplasma and early freeze-downs were preferentially used. Mice were inoculated in the abdominal mammary gland with 100 μl DMEM containing 7 × 103 or 105 4T1 cells, or in the flank with 5 × 105 MC38 cells. Primary tumors were measured as described (42). Survival time was recorded when mice became moribund and were euthanized. All animal procedures were approved by the University of Maryland Baltimore County Institutional Animal Care and Use Committee. MDSC were harvested from the peripheral blood of tumor-bearing mice as described (41). Briefly, 4T1 tumor-bearing Nrf2+/+ and Nrf2−/− mice with tumors >10 mm in diameter were bled by submandibular venipuncture into 500 μl of an 0.008% heparin solution. RBC were removed by lysis, and the remaining cells were analyzed by flow cytometry for MDSC. Cell populations containing >90% Gr1+CD11b+ cells were used in all functional assays. mAbs rat anti-mouse CCR2-PE, CD3-FITC, CD4-allophycocyanin-Cy7, CD8-allophycocyanin, CD11b-allophycocyanin, CD11b-allophycocyanin-Cy7, CD11c-FITC, CD45–Pacific Blue, CD45R-PE, CD62L-PE, CXCR4-PE, Ly6C-PE, Gr1-allophycocyanin-Cy7, Ly6G–Alexa Fluor 647, isotype rat IgG2b-PE, dichlorofluorescein diacetate (DCFDA), propidium iodide (PI), annexin V, and 7-aminoactinomycin D (7AAD) were from BD Pharmingen (San Diego, CA) or BioLegend (San Diego, CA). Cells were stained with Abs, with annexin V and PI, or with DCFDA as described (43, 44). Samples were analyzed on a Beckman Coulter Cyan ADP flow cytometer using Summit software. Tumors were dissociated using a modified protocol from a tissue dissociation kit (protocol 2.2.1; Miltenyi Biotec, Bergisch Gladbach, Germany) with a gentleMACS dissociator. Tumors 8–12 mm in diameter were resected from 4T1-bearing mice, cut in half, and each half was placed into a gentleMACS C tube containing 5 ml dissociation medium (DMEM with 300 U/ml collagenase IV, 0.1% hyaluronidase, and 2 kU/ml DNase I). Tumors were then minced with scissors into 2- to 4-mm pieces, processed on the gentleMACS dissociator with the program m_impTumor_02, and then rotated (10 rpm; Glas-Col rotator) at 37°C for 40 min. Samples were then processed twice on the gentleMACS dissociator using the program m_impTumor_03. The resulting material was filtered through a 70-μm mesh filter and the cells that passed through the filter were washed twice with 10 ml DMEM (Beckman Allegra 6R centrifuge, 500 × g for 3 min), resuspended in 4 ml DMEM, and subjected to Ficoll-Paque density gradient centrifugation (Beckman Allegra 6R centrifuge, 1400 × g for 20 min at 20°C). Live cells were isolated from the Ficoll–aqueous interface, washed twice with DMEM, stained with 7AAD and, for F4/80, Gr1, or Ly6G and Ly6C, CD3, CD4, CD8, CD11b, CD11c, CD45, and CD45R (B220), and assessed by flow cytometry. Cell percentages were calculated as the percentage of 7AAD−CD45+ cells. MDSC were generated from bone marrow progenitors as described (45). Briefly, bone marrow was flushed aseptically from the femurs of naive mice. RBC were lysed with Gey’s solution and the resulting cells were assayed for the percentage of Gr1+CD11b+ cells and cultured in triplicate for 4 d (37°C, 5% CO2) at 4.2 × 105 cells per 2 ml RPMI 1640 medium supplemented with 10% FCS, 80 ng/ml IL-6, and 80 ng/ml GM-CSF per 2 ml per well in six-well plates. At the end of culture, the total number of cells was determined, and the percentage of granulocytic (Ly6GhiLy6CloCD11b+; polymorphonuclear [PMN]-MDSC) and monocytic (Ly6GloLy6ChiCD11b+; monocytic MDSC [M-MDSC]) MDSC was determined by flow cytometry. The following determinations were made: number of MDSC = [(total no. cells) × (% M-MDSC and/or PMN-MDSC)]; ratio of MDSC from Nrf2−/− versus Nrf2+/+ mice = total MDSC from Nrf2−/− mice/total MDSC from Nrf2+/+ mice; and ratio PMN-MDSC to M-MDSC = total PMN-MDSC/total M-MDSC. Live MDSC were identified as 7AAD− or PI− and Gr1+CD11b+ or CD11b+Ly6G+, or CD11b+Ly6C+ cells. The percentage decrease in apoptosis was determined as: 100 × [1 −(% annexin V+ MDSC from Nrf2+/+ mice/% annexin V+ MDSC from Nrf2−/− mice)]. For some experiments, MDSC were harvested from the blood of 4T1-tumor bearing mice, resuspended in HL-1 media (supplemented with 1% penicillin-streptomycin, 1% GlutaMAX, and 0.1% gentamicin), and plated in 6-cm petri dishes. Gr1+CD11b+ cells were assessed for viability by PI staining. ROS were measured by H2O2 detection using an Amplex Red H2O2 assay kit (Invitrogen) as described (46). Briefly, MDSC were suspended in Dulbecco’s PBS at 2.5 × 106/ml and 5 × 104 cells/50 μl were plated per well in 96-well black, flat-bottom plates (Greiner Bio-One, Monroe, NC). PMA (30 ng/ml) and 50 μl Amplex Red reagent were added to each well. Plates were incubated at 37°C and fluorescence (excitation at 530 nm, emission at 590 nm) was measured for 1 h at 5-min intervals using a Synergy 2 microplate plate reader (BioTek, Winooski, VT). A standard curve was generated by serial dilutions of 20 μM H2O2. T cell activation was measured as described (44). Briefly, 105 splenocytes from DO11.10 (OVA323–339 specific, I-Ad restricted), TS1 (hemagglutinin110–119 specific, I-Ed restricted), clone 4 (hemagglutinin518–526 specific, H-2Kd restricted), or OT1 (OVA257–264 specific, H-2Kb restricted) transgenic mice were cultured with their respective cognate peptides and varying concentrations of irradiated (20 Gy) MDSC from the blood of 4T1 tumor-bearing mice. Catalase (1000 or 500 U/ml; Sigma-Aldrich), sodium pyruvate (5 or 2.5 μM; Sigma-Aldrich), Nω-hydroxy-nor-arginine (nor-NOHA, 500 μM; Calbiochem, CA), or NG-monomethyl-l-arginine monoacetate (l-NMMA, 500 μM; Calbiochem) was included in some assays. Reversal of suppression was determined as: −100% × [1 − (cpmno inhibitor/cpminhibitor)]. For some experiments, Nrf2+/+ MDSC were either initially cultured with splenocytes or added after the addition of cognate peptide. Fresh MDSC were used for experiments in which MDSC were added to overnight splenocyte cultures. Cultures were pulsed with [3H]thymidine (1 nanocurie/250 μl) on day 4 and harvested on day 5. Peptides were synthesized at the University of Maryland Baltimore Biopolymer Core Facility. Peritoneal macrophages were prepared from tumor-free mice as described (35) and were >95% CD11b+F4/80+ cells as assessed by flow cytometry. MDSC and macrophage cross-talk experiments were performed as described (47). Supernatants were analyzed for IL-10 using ELISA kits (R&D Systems and eBioscience, San Diego, CA) per the manufacturer’s protocol. NO was assayed by a Griess assay as described (47). A Student t test and Tukey honest significant difference test were performed using Microsoft Excel 2013. In Supplemental Figs. 2 and 3, values denoted with different letters (e.g., a, b, c) are significantly different from each other; values with the same letter are not significantly different. Tumor growth and ROS data were analyzed using the Mann–Whitney U test on the VassarStats website (http://www.VassarStats.net). Survival data were analyzed using the log-rank test from the Walter and Eliza Hall Institute of Medical Research Bioinformatics website (http://bioinf.wehi.edu.au/software/russell/logrank/). The p values <0.05 were considered statistically significant. Values are ± SD. The role of host-derived Nrf2 in tumor progression has been controversial. Some studies indicate that Nrf2 supports tumor growth (48–53), whereas other studies suggest it deters carcinogenesis (54–58). 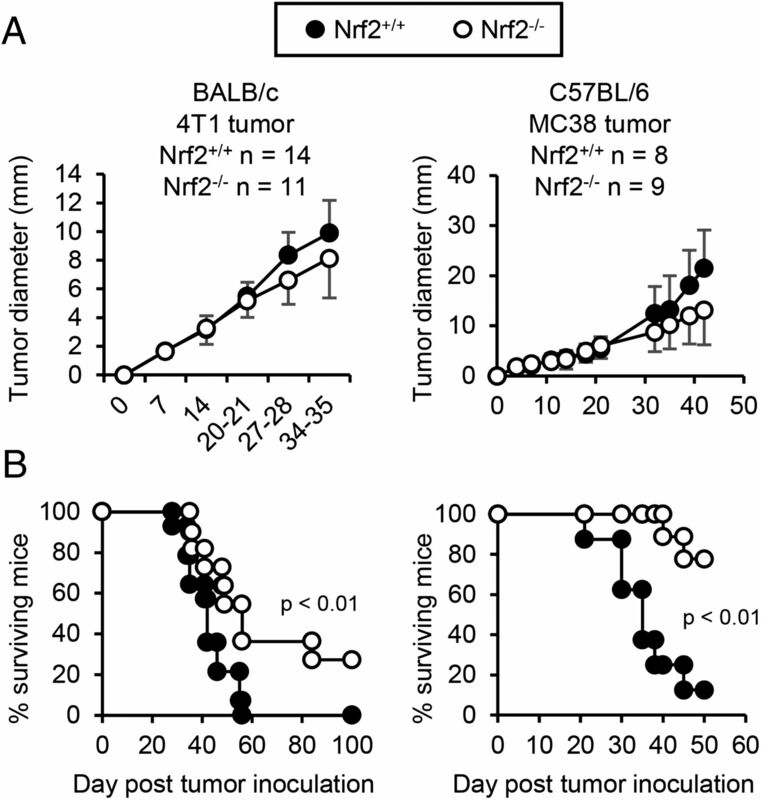 To determine whether host Nrf2 contributes to or deters tumor growth in BALB/c and C57BL/6 mice, Nrf2+/+ and Nrf2−/− BALB/c and C57BL/6 mice were injected with syngeneic 4T1 mammary carcinoma or MC38 colon carcinoma, respectively, and followed for primary tumor growth (Fig. 1A) and survival (Fig. 1B). Nrf2 did not impact the growth rate of either primary tumor. However, tumor-bearing Nrf2+/+ mice had decreased mean survival times compared with Nrf2−/− mice (BALB/c, 42.2 versus 50.8 d; 0 and 27.27% of mice survived >100 d, respectively; C57BL/6, 35.8 versus 43 d; 12.5 and 77.78% of mice survived >50 d, respectively), indicating that Nrf2 supports tumor progression in these mouse strains. Nrf2 decreases survival time of tumor-bearing mice. Nrf2+/+ and Nrf2−/− mice on the BALB/c or C57BL/6 backgrounds were injected with 4T1 mammary carcinoma or MC38 colon carcinoma, respectively. Mice were followed weekly for primary tumor growth (A) and survival time (B). Tumor diameter was calculated as the average measurement of tumor length and width. Data were pooled from two independent experiments. Tumor growth and survival time were tested for statistical significance by Mann–Whitney and log-rank test, respectively. If Nrf2 mediates its effects by increasing MDSC suppressive potency, then MDSC from tumor-bearing Nrf2+/+ mice will be more suppressive than MDSC from Nrf2−/− mice. To test this possibility, titered quantities of MDSC from tumor-bearing BALB/c Nrf2+/+ and Nrf2−/− mice were cocultured with T cells from TcR transgenic mice plus cognate peptide, and the cultures wereassayed for T cell activation (Fig. 2A, Supplemental Fig. 2A). Both CD4+ and CD8+ T cells were suppressed more efficiently by MDSC from Nrf2+/+ mice than by MDSC from Nrf2−/− mice, suggesting that Nrf2 drives the suppressive potency of MDSC. Because differences in MDSC viability may impact suppressive potency, we determined the kinetics of MDSC-mediated suppression (Supplemental Fig. 2B) and then assessed the viability of MDSC at the time they would be active (Supplemental Fig. 2C). Addition of MDSC to splenocyte plus cognate peptide cultures at or after 19 h did not result in suppression, indicating that MDSC viability was only relevant at ≤16 h, although viability did not differ up to 24 h in culture. These data demonstrate that MDSC from Nrf2+/+ mice are more suppressive than MDSC from Nrf2−/− mice and that the difference is not due to differences in MDSC viability. Nrf2 enhances MDSC suppressive activity and the quantity of tumor-infiltrating MDSC. 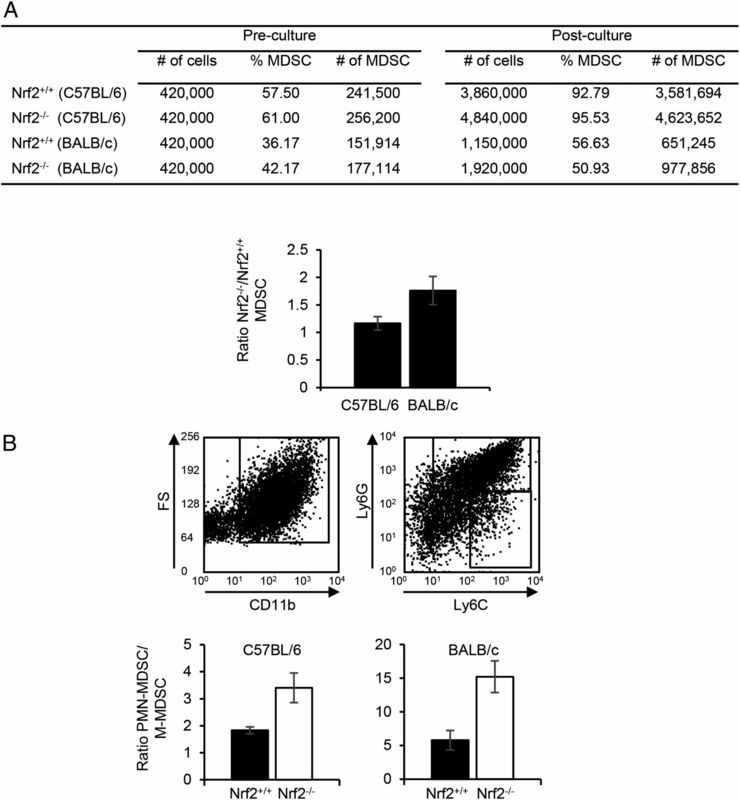 (A) Nrf2 enhances MDSC-mediated CD4+ T cell suppression. MDSC from the peripheral blood of 4T1-bearing BALB/c Nrf2+/+ and Nrf2−/− mice were assayed for their ability to suppress the Ag activation of transgenic CD4+ (DO11.10) T cells. (B) Nrf2 enhances MDSC production of H2O2. MDSC from BALB/c Nrf2+/+ and Nrf2−/− mice with 4T1 tumors were incubated with Amplex Red reagent, stimulated with PMA, and assayed for H2O2 production over time. (C) Nrf2+/+ and Nrf2−/− MDSC suppress CD4+ T cell activation by producing arginase and H2O2. MDSC from the peripheral blood of 4T1-bearing BALB/c Nrf2+/+ and Nrf2−/− mice were assayed for their ability to suppress the Ag activation of transgenic CD4+ (DO11.10) T cells in the presence of nor-NOHA, l-NMMA, catalase, and sodium pyruvate. (D) Nrf2 enhances the quantity of tumor-infiltrating MDSC. Each circle represents an individual mouse. (A), (B), and (D) were analyzed by a Student t test, Mann–Whitney U test, and Wilcoxon signed-rank test, respectively. (A)–(C) represent one of two experiments, each with one Nrf2+/+ and one Nrf2−/− mouse per experiment. Data from (D) were pooled from five independent experiments. *p < 0.05, **p < 0.01. MDSC use several mechanisms to inhibit T cells, such as the secretion of ROS, including H2O2, which decreases T cell expression of IL-2, IFN-γ, and CD3ζ (36, 59), and the production of arginase, which deprives T cells of the amino acid arginine, leading to CD3ζ synthesis arrest (60). MDSC also sequester cysteine, which is an essential amino acid for T cell activation (61). MDSC from Nrf2+/+ mice secrete more H2O2 than do MDSC from Nrf2−/− mice (Fig. 2B). H2O2 contributes to the suppressive potency of MDSC because inclusion of the H2O2 scavengers catalase or sodium pyruvate in cultures of MDSC plus transgenic T cells plus cognate peptide significantly increased T cell activation (Fig. 2C, Supplemental Fig. 2D). MDSC from Nrf2+/+ and Nrf2−/− mice did not produce NO (Supplemental Fig. 3A), and the inducible NO synthase 2 inhibitor l-NMMA did not rescue T cell activation in the presence of MDSC (Fig. 2C, Supplemental Fig. 2D). MDSC from both Nrf2+/+ and Nrf2−/− mice use arginase to suppress T cell activation because inclusion of the arginase inhibitor nor-NOHA restores T cell activation (Fig. 2C, Supplemental Fig. 2D), and there is no difference in their content of arginase (Supplemental Fig. 3B). MDSC from both wild-type and knockout mice express similar levels of xCT, one of the chains of the dimeric xc− transporter that regulates the uptake of cystine (Supplemental Fig. 3C). These results indicate that MDSC from Nrf2+/+ and Nrf2−/− mice use similar mechanisms to suppress T cell activation and proliferation, but MDSC from Nrf2+/+ mice are more suppressive because they produce more H2O2. MDSC also promote tumor progression by downregulating L-selectin on naive T cells, thereby preventing naive T cell trafficking into lymph nodes (32), and they produce IL-10, which polarizes macrophages toward a tumor-promoting phenotype (35). MDSC from Nrf2+/+ and Nrf2−/− tumor-bearing BALB/c mice equally downregulated T cell l-selectin (Supplemental Fig. 3D), demonstrating that Nrf2 does not affect naive T cell entry into lymph nodes. Using MDSC and macrophages from BALB/c IL-10+/+ and IL-10−/− mice, we previously demonstrated that in cocultures of MDSC and macrophages, MDSC are the sole producers of IL-10, and that MDSC production of IL-10 is enhanced by macrophages (35, 47, 62). Surprisingly, Nrf2 decreased MDSC production of IL-10, thus reducing the ability of MDSC to polarize macrophages toward a type 2 phenotype (Supplemental Fig. 3E). These results indicate that Nrf2 does not impact the ability of MDSC to decrease T cell homing to lymph nodes, but it does reduce the ability of MDSC to polarize macrophages toward a tumor-promoting phenotype. Because MDSC are present in most solid tumors where they can exert protumor activity (63), we assessed the proportion of MDSC in 4T1 primary tumors resected from BALB/c Nrf2+/+ and Nrf2−/− mice (Fig. 2D). Tumors derived from Nrf2−/− mice had significantly fewer MDSC compared with tumors from wild-type littermates. However, the ratio of tumor-infiltrating PMN-MDSC to M-MDSC was the same in Nrf2+/+ and Nrf2−/− mice (Supplemental Fig. 4A). The proportion of tumor-infiltrating CD11c+, CD4+, and CD8+ cells did not differ between the Nrf2+/+ and Nrf2−/− mice, but tumors from Nrf2−/− mice contained significantly more F4/80+ and B220+ cells (Fig. 2D). To determine whether the differences in tumor-infiltrating MDSC were due to differences in MDSC trafficking, MDSC were isolated from the peripheral blood, bone marrow, and tumor of 4T1-bearing Nrf2+/+ and Nrf2−/− mice and assayed for CCR2 and CXCR4, chemokine receptors that regulate MDSC migration (64, 65) (Supplemental Fig. 4B). CCR2 and CXCR4 expression did not differ between MDSC from Nrf2+/+ and Nrf2−/− mice. Likewise, MDSC from Nrf2+/+ and Nrf2−/− mice migrated at the same rate in a Transwell chemotaxis assay (Supplemental Fig. 4C), indicating that Nrf2 does not influence MDSC trafficking. Collectively, these data suggest that Nrf2 decreases the survival time of tumor-bearing mice by enhancing MDSC suppressive activity and by increasing the accessibility of MDSC to the TME. Because the increased number of tumor-infiltrating MDSC in Nrf2+/+ mice was not due to enhanced MDSC trafficking, we speculated that MDSC in Nrf2+/+ mice had lower levels of intracellular ROS and therefore were less oxidatively stressed. Therefore, we assessed intracellular ROS levels in MDSC from 4T1-bearing Nrf2+/+ and Nrf2−/− mice and in MDSC differentiated in vitro from bone marrow progenitor cells. MDSC in the blood of Nrf2+/+ 4T1-bearing mice had significantly lower levels of intracellular ROS compared with MDSC in Nrf2−/− mice as measured by DCFDA fluorescence (Fig. 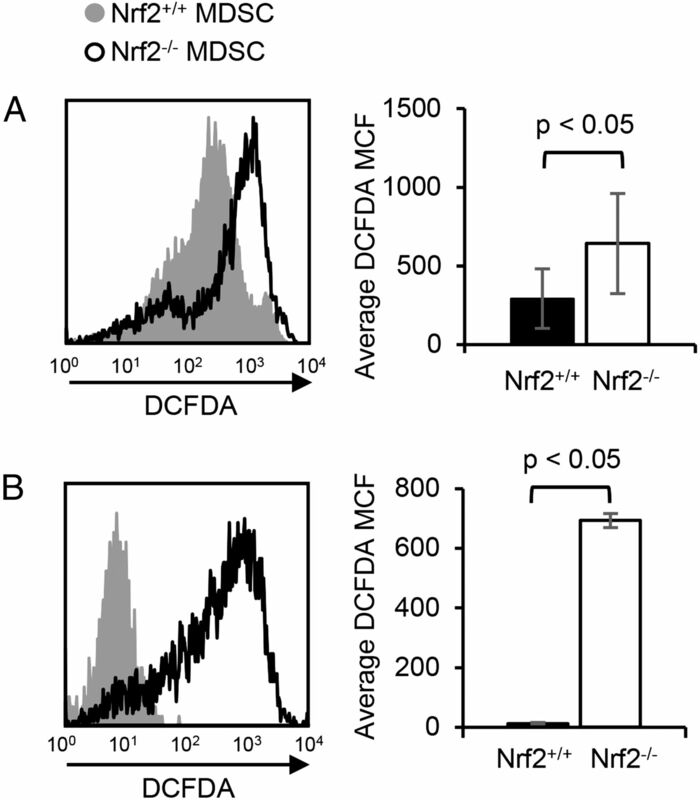 3A), as did MDSC differentiated from bone marrow progenitor cells of Nrf2+/+ mice (Fig. 3B). Therefore, Nrf2 reduces intracellular ROS, consistent with the concept that MDSC in Nrf2+/+ mice survive longer owing to reduced oxidative stress. Nrf2 decreases intracellular MDSC oxidative stress. (A) Circulating MDSC from tumor-bearing Nrf2-sufficient mice contain less intracellular ROS than do MDSC from tumor-bearing Nrf2-deficient mice. Circulating MDSC were harvested from 4T1-bearing BALB/c Nrf2+/+ and Nrf2−/− mice, stained with DCFDA, and for Gr1 and CD11b. Gr1+CD11b+ cells were gated and analyzed by flow cytometry for DCFDA fluorescence. Left panel, MDSC from representative individual Nrf2+/+ and Nrf2−/− mice. Right panel, Average MCF of DCFDA staining for MDSC from six Nrf2+/+ and five Nrf2−/− mice. (B) Nrf2 decreases intracellular ROS in MDSC differentiated in vitro from bone marrow progenitor cells. Bone marrow cells from tumor-free BALB/c Nrf2+/+ or Nrf2−/− mice were cultured under conditions favoring MDSC differentiation, and the resulting cells were stained with 7AAD and DCFDA, and for Gr1 and CD11b. 7AAD−Gr1+CD11b+ cells were gated and analyzed by flow cytometry for DCFDA fluorescence. Left panel, MDSC from representative individual Nrf2+/+ and Nrf2−/− mice. Right panel, Average MCF of DCFDA staining of MDSC from three Nrf2+/+ and three Nrf2−/− mice. Data were tested for statistical significance by Student t test. MCF, mean channel fluorescence. To determine whether reduced levels of oxidative stress in MDSC from Nrf2+/+ mice correlate with reduced apoptosis, in vivo tumor-induced and in vitro–differentiated MDSC were examined for apoptosis. Circulating MDSC from 4T1 tumor-bearing Nrf2+/+ and Nrf2−/− mice were stained for Gr1 and CD11b, as well as with annexin V (Fig. 4A). MDSC from Nrf2+/+ mice were 53% less apoptotic than MDSC from Nrf2−/− mice. MDSC differentiated in vitro in bone marrow cultures were similarly analyzed except dead cells were excluded by 7AAD staining. In vitro–differentiated MDSC from Nrf2+/+mice were 29% less apoptotic compared with MDSC from Nrf2−/− mice (Fig. 4B), confirming the concept that reducing oxidative stress decreases apoptosis. Nrf2 protects MDSC from apoptosis. (A) Nrf2 decreases apoptosis in circulating MDSC of tumor-bearing mice. Circulating MDSC were harvested from 4T1-bearing BALB/c Nrf2+/+ and Nrf2−/− mice and stained for Gr1, CD11b, and with annexin V and PI or 7AAD, and analyzed by flow cytometry. Live Gr1+CD11b+ MDSC (PI− or 7AAD−) were gated and assessed for annexin V. Left panel, MDSC from representative individual mouse. Right panel, Average percentage annexin V+Gr1+CD11b+ MDSC from six Nrf2+/+ and five Nrf2−/− mice. (B) Nrf2 decreases apoptosis in MDSC differentiated in vitro from bone marrow progenitor cells. MDSC derived from bone marrow cell cultures were harvested, stained, and analyzed as in (A). Averaged data are from triplicate cultures of one of three independent experiments with one Nrf2+/+ and one Nrf2−/− mouse per experiment. Data were tested for statistical significance using a Student t test. A decrease in apoptotic rate could result in an increase in circulating MDSC. This possibility was tested by comparing the levels of MDSC in the blood of tumor-bearing Nrf2+/+ versus Nrf2−/− mice. Mice with similiar tumor diameters were compared to eliminate MDSC differences due to different tumor burdens (Supplemental Fig. 4D). 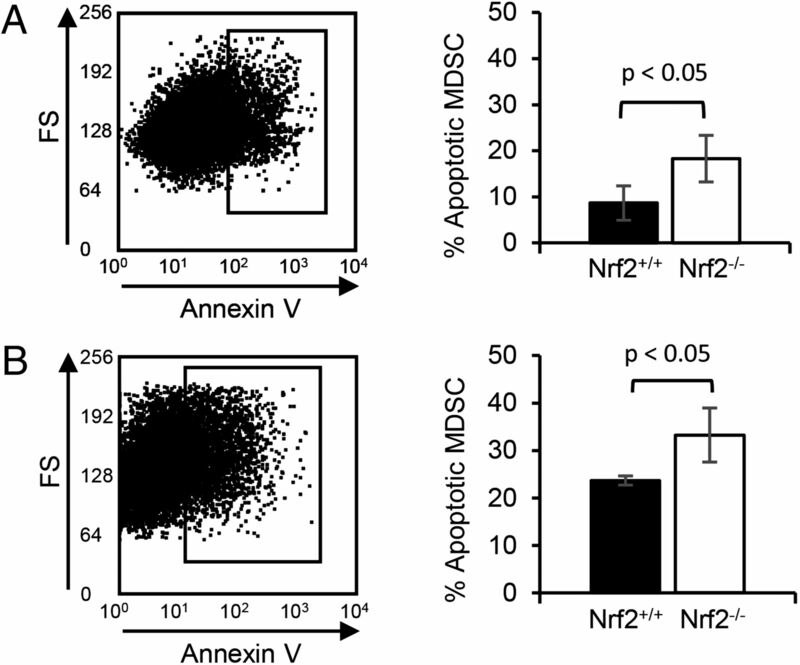 There was no difference in the level of circulating MDSC in tumor-bearing Nrf2+/+ and Nrf2−/− mice, indicating that the differential apoptotic rates did not impact MDSC accumulation in blood. Because MDSC from Nrf2−/− mice are more apoptotic than MDSC from Nrf2+/+ mice, yet tumor-bearing Nrf2+/+ and Nrf2−/− mice have similar levels of circulating MDSC, we hypothesized that MDSC differentiate more rapidly in Nrf2−/− mice. To test this hypothesis, bone marrow cells from tumor-free Nrf2+/+ and Nrf2−/− mice were cultured under conditions to promote MDSC differentiation, and the number of resulting MDSC was quantified (Fig. 5A). C57BL/6 and BALB/c Nrf2−/− bone marrow produced 16 and 76% more MDSC, respectively, than did the corresponding Nrf2+/+ bone marrow. The increases were due to the expansion of PMN-MDSC (Fig. 5B). Therefore, Nrf2 reduces the rate of MDSC generation from bone marrow progenitor cells. Taken together with the apoptotic studies of Fig. 4, these data indicate that circulating MDSC levels are maintained by a balance between the generation of MDSC in the bone marrow and their turnover in the periphery. Nrf2 deficiency enhances MDSC proliferation. MDSC were differentiated in vitro from the bone marrow of tumor-free Nrf2+/+ and Nrf2−/− BALB/c and C57BL/6 mice. The resulting cells were harvested, counted, and stained for Ly6G, Ly6C, and CD11b, and were analyzed by flow cytometry. PMN-MDSC and M-MDSC were identified as LyG+Ly6C−/lowCD11b+ and Ly6G−/lowLy6C+CD11b+ cells, respectively. (A) Top, Quantity of total cells, percentage of cells that are MDSC, and absolute number of MDSC preculture and after in vitro differentiation (postculture). Data are representative of one of three independent experiments with one Nrf2+/+ and one Nrf2−/− mouse per experiment. Bottom, Ratio of Nrf2−/− to Nrf2+/+ MDSC from the three independent experiments. A value of >1 indicates that there is more proliferation in the absence of Nrf2. (B) Nrf2 deficiency preferentially enhances differentiation of PMN-MDSC from bone marrow progenitor cells. MDSC of (A) were gated and analyzed for PMN-MDSC and M-MDSC. Top, Representative staining of M-MDSC and PMN-MDSC from individual Nrf2+/+ and Nrf2−/− mice. Bottom, Average ratio of PMN-MDSC to M-MDSC from the three independent experiments. For cells to survive the hostile TME, they must protect themselves against oxidative stress. Because Nrf2 regulates many genes that enable cells to survive oxidative stress, we examined the role of Nrf2 in the maintenance of MDSC suppressive activity, survival, and presence in solid tumors. Nrf2 enhanced MDSC suppressive activity by increasing MDSC production of H2O2, and it increased the quantity of tumor-infiltrating MDSC by reducing their oxidative stress and apoptotic rate. Nrf2 did not affect circulating levels of MDSC in tumor-bearing mice because the decreased apoptotic rate of tumor-infiltrating MDSC was balanced by a decreased rate of differentiation from bone marrow progenitor cells. Collectively, these results provide a new avenue by which Nrf2 regulates tumor progression and add Nrf2 to the list of genes that govern MDSC accumulation, survival, and function. Because our studies used mice globally knocked out for Nrf2, we cannot determine whether Nrf2 is directly impacting MDSC or is indirectly affecting MDSC by acting on other cells that subsequently influence MDSC development. Regardless of whether the effects are direct or indirect, Nrf2 regulates MDSC survival, function, and homeostasis. The TME is an inflamed milieu that includes multiple cell types (e.g., tumor cells, MDSC, macrophages, dendritic cells, lymphocytes, mast cells, neutrophils, cancer-associated fibroblasts). These cells participate in a complex cross-talk network that regulates the production of inflammatory mediators (47). Nrf2 increases the number of tumor-infiltrating MDSC and therefore enhances the opportunity for cross-talk between MDSC and other tumor-resident cells. Our previous studies demonstrated that macrophages enhance MDSC production of IL-10, which in turn polarizes macrophages toward a tumor-promoting phenotype (35, 47). Because Nrf2 deficiency increases both macrophage-dependent and macrophage-independent IL-10 production by MDSC, strategies aimed at limiting Nrf2 may facilitate the development of protumor macrophages. Pharmacologic downregulation of Nrf2 may decrease the quantity of tumor-infiltrating MDSC and their suppressive potency. However, it will not reduce the level of circulating MDSC due to the homeostatic compensation by increased generation of MDSC from bone marrow progenitor cells. If MDSC predominantly mediate their suppressive effects on T cells within the tumor, then Nrf2 downregulation may reduce MDSC-mediated suppression. However, MDSC may also mediate their effects on T cells in the periphery by suppressing circulating tumor-reactive T cells. Additionally, MDSC are known to prevent the entry of naive T cells into lymph nodes where they could become activated (32, 45). Therefore, downregulation of Nrf2 in MDSC may only marginally reduce immune suppression and improve antitumor immunity because levels of circulating MDSC will remain constant due to increased generation of MDSC from bone marrow progenitor cells. It is unlikely that the homeostatic balance of MDSC in tumor-bearing individuals is achieved by Nrf2 directly regulating genes that drive MDSC generation. Ab-mediated depletion of MDSC results in the rebound of MDSC to levels that are higher than predepletion levels (66), demonstrating that some type of feedback mechanism regulates MDSC homeostasis. Because Nrf2, similar to Ab-mediated depletion, alters extramedullary levels of MDSC, Nrf2 most likely also regulates MDSC homeostasis via a feedback loop rather than by a direct effect on genes within bone marrow progenitor cells. Given that homeostasis maintains a constant level of circulating MDSC in individuals with tumor, monotherapies aimed at reducing MDSC levels by targeting circulating MDSC are unlikely to be effective. In contrast, strategies that target the induction of MDSC from progenitor cells have the potential to interrupt homeostatic regulation and thereby reduce MDSC levels. Many inducers of MDSC have been identified. These are predominantly proinflammatory molecules (67, 68). Because these molecules are redundant and compensate for each other in their ability to drive MDSC generation, it will be necessary to develop inhibitors that cover the full range of inducers. Whether the depletion of MDSC by their differentiation into macrophages or other myeloid cells also results in the replacement of immunosuppressive MDSC by homeostasis is unknown. However, if this process does not increase the differentiation of MDSC from bone marrow progenitors, then promoting MDSC differentiation may be therapeutic. Indeed, drugs such as CpG motifs (69), all-trans retinoic acid (70), tetrabromocinnamic acid (71), and vitamin D3 (72) that drive the differentiation of MDSC to more mature cells have shown therapeutic effects. Interestingly, all-trans retinoic acid is a known Nrf2 inhibitor (73), suggesting that there is interplay between MDSC differentiation and Nrf2 activity. Because Nrf2 impacts other cells in the TME in addition to MDSC, global inhibition of Nrf2 may impact overall tumor progression. For example, inhibition of Nrf2 in dendritic cells enhances MHC class II and CD86 expression (74), which could result in improved Ag presentation and therefore better activation of tumor-reactive T cells. Additionally, Nrf2 activation in tumor cells increases tumor cell proliferation and resistance to chemotherapy and radiotherapy, thereby promoting tumor progression (reviewed in Ref. 75). Because MDSC accumulation is positively correlated with tumor burden, treatment strategies that combine Nrf2 inhibitors with conventional chemotherapy and radiotherapy could decrease tumor burden and thereby indirectly reduce MDSC levels and increase antitumor immunity. We thank Drs. Masayuki Yamamoto (Tohoku University Graduate School of Medicine) and Shyam Biswal (Johns Hopkins University) for providing breeding pairs of the BALB/c Nrf2+/− and C57BL/6 Nrf2−/− mice, respectively, Dr. Tiha Long (University of Maryland Baltimore County) for quantitative RT-PCR primer design, and Dr. Anil Jaiswal (University of Maryland, Baltimore, MD) for helpful discussions. This work was supported by National Institutes of Health Grants R01 CA115880, R01 CA84232, and R01 GM021248 (to S.O.-R.). D.W.B. was partially supported by a Department of Defense Breast Cancer Program Predoctoral Fellowship (Contract W81XWH-11-1-0115). Copyright © 2016 by The American Association of Immunologists, Inc.
. 2010. Reactive oxygen species in cancer. Free Radic. Res. 44: 479–496.
. 2015. Clinicopathological significance of nuclear factor (erythroid-2)-related factor 2 (Nrf2) expression in gastric cancer. BMC Cancer 15: 5.
. 2013. Nrf2 prevents initiation but accelerates progression through the Kras signaling pathway during lung carcinogenesis. Cancer Res. 73: 4158–4168.
. 2009. Nrf2 enhances cell proliferation and resistance to anticancer drugs in human lung cancer. Clin. Cancer Res. 15: 3423–3432.
. 1995. Control of Drosophila head segment identity by the bZIP homeotic gene cnc. Development 121: 237–247.
. 1993. Isolation of cDNA encoding the human NF-E2 protein. Proc. Natl. Acad. Sci. USA 90: 11366–11370.
. 1994. Isolation of NF-E2-related factor 2 (Nrf2), a NF-E2-like basic leucine zipper transcriptional activator that binds to the tandem NF-E2/AP1 repeat of the beta-globin locus control region. Proc. Natl. Acad. Sci. USA 91: 9926–9930.
. 2004. Scaffolding of Keap1 to the actin cytoskeleton controls the function of Nrf2 as key regulator of cytoprotective phase 2 genes. Proc. Natl. Acad. Sci. USA 101: 2046–2051.
. 2003. Increased protein stability as a mechanism that enhances Nrf2-mediated transcriptional activation of the antioxidant response element. Degradation of Nrf2 by the 26 S proteasome. J. Biol. Chem. 278: 4536–4541.
. 2004. The Keap1-BTB protein is an adaptor that bridges Nrf2 to a Cul3-based E3 ligase: oxidative stress sensing by a Cul3-Keap1 ligase. Mol. Cell. Biol. 24: 8477–8486.
. 2004. Oxidative stress sensor Keap1 functions as an adaptor for Cul3-based E3 ligase to regulate proteasomal degradation of Nrf2. Mol. Cell. Biol. 24: 7130–7139.
. 2004. Keap1 is a redox-regulated substrate adaptor protein for a Cul3-dependent ubiquitin ligase complex. Mol. Cell. Biol. 24: 10941–10953.
. 2002. Direct evidence that sulfhydryl groups of Keap1 are the sensors regulating induction of phase 2 enzymes that protect against carcinogens and oxidants. Proc. Natl. Acad. Sci. USA 99: 11908–11913.
. 2003. Distinct cysteine residues in Keap1 are required for Keap1-dependent ubiquitination of Nrf2 and for stabilization of Nrf2 by chemopreventive agents and oxidative stress. Mol. Cell. Biol. 23: 8137–8151.
. 2010. Keap1 perceives stress via three sensors for the endogenous signaling molecules nitric oxide, zinc, and alkenals. Proc. Natl. Acad. Sci. USA 107: 18838–18843.
. 2003. Phosphorylation of Nrf2 at Ser40 by protein kinase C in response to antioxidants leads to the release of Nrf2 from INrf2, but is not required for Nrf2 stabilization/accumulation in the nucleus and transcriptional activation of antioxidant response element-mediated NAD(P)H:quinone oxidoreductase-1 gene expression. J. Biol. Chem. 278: 44675–44682.
. 2003. Nitric oxide stimulates Nrf2 nuclear translocation in vascular endothelium. Biochem. Biophys. Res. Commun. 307: 973–979.
. 2003. Nrf2 is a direct PERK substrate and effector of PERK-dependent cell survival. Mol. Cell. Biol. 23: 7198–7209.
. 2002. Phosphorylation of Nrf2 at Ser-40 by protein kinase C regulates antioxidant response element-mediated transcription. J. Biol. Chem. 277: 42769–42774.
. 1999. Role of a mitogen-activated protein kinase pathway in the induction of phase II detoxifying enzymes by chemicals. J. Biol. Chem. 274: 27545–27552.
. 2000. Inhibition of ERK and p38 MAP kinases inhibits binding of Nrf2 and induction of GCS genes. Biochem. Biophys. Res. Commun. 278: 484–492.
. 1997. An Nrf2/small Maf heterodimer mediates the induction of phase II detoxifying enzyme genes through antioxidant response elements. Biochem. Biophys. Res. Commun. 236: 313–322.
. 2007. Role of increased expression of the proteasome in the protective effects of sulforaphane against hydrogen peroxide-mediated cytotoxicity in murine neuroblastoma cells. Free Radic. Biol. Med. 43: 809–817.
. 1999. Nrf2, a Cap’n’Collar transcription factor, regulates induction of the heme oxygenase-1 gene. J. Biol. Chem. 274: 26071–26078.
. 2000. Transcriptional regulation of the antioxidant response element. Activation by Nrf2 and repression by MafK. J. Biol. Chem. 275: 15466–15473.
. 1999. Regulation of γ-glutamylcysteine synthetase subunit gene expression by the transcription factor Nrf2. J. Biol. Chem. 274: 33627–33636.
. 1998. Nrf2 and Nrf1 in association with Jun proteins regulate antioxidant response element-mediated expression and coordinated induction of genes encoding detoxifying enzymes. Oncogene 17: 3145–3156.
. 1997. Functional antioxidant responsive elements. Proc. Natl. Acad. Sci. USA 94: 5361–5366.
. 1993. Chemical and molecular regulation of enzymes that detoxify carcinogens. Proc. Natl. Acad. Sci. USA 90: 2965–2969.
. 1992. Regulation of human NAD(P)H:quinone oxidoreductase gene. Role of AP1 binding site contained within human antioxidant response element. J. Biol. Chem. 267: 15097–15104.
. 2007. The terminology issue for myeloid-derived suppressor cells. Cancer Res. 67: 425–426, author reply 426.
. 2009. Myeloid-derived suppressor cells down-regulate L-selectin expression on CD4+ and CD8+ T cells. J. Immunol. 183: 937–944.
. 2007. Expansion of spleen myeloid suppressor cells represses NK cell cytotoxicity in tumor-bearing host. Blood 109: 4336–4342.
. 2006. Gr-1+CD115+ immature myeloid suppressor cells mediate the development of tumor-induced T regulatory cells and T-cell anergy in tumor-bearing host. Cancer Res. 66: 1123–1131.
. 2007. Cross-talk between myeloid-derived suppressor cells and macrophages subverts tumor immunity toward a type 2 response. J. Immunol. 179: 977–983.
. 2009. Mechanism regulating reactive oxygen species in tumor-induced myeloid-derived suppressor cells. J. Immunol. 182: 5693–5701.
. 2006. TCRζ down-regulation under chronic inflammation is mediated by myeloid suppressor cells differentially distributed between various lymphatic organs. J. Immunol. 177: 4763–4772.
. 2001. Activated granulocytes and granulocyte-derived hydrogen peroxide are the underlying mechanism of suppression of t-cell function in advanced cancer patients. Cancer Res. 61: 4756–4760.
. 2007. Altered recognition of antigen is a mechanism of CD8+ T cell tolerance in cancer. Nat. Med. 13: 828–835.
. 2011. Tumor-infiltrating myeloid cells induce tumor cell resistance to cytotoxic T cells in mice. J. Clin. Invest. 121: 4015–4029.
. 2012. Tumor-induced myeloid-derived suppressor cell function is independent of IFN-γ and IL-4Rα. Eur. J. Immunol. 42: 2052–2059.
. 2006. Inflammation induces myeloid-derived suppressor cells that facilitate tumor progression. J. Immunol. 176: 284–290.
. 2011. Proteomic pathway analysis reveals inflammation increases myeloid-derived suppressor cell resistance to apoptosis. Mol. Cell. Proteomics 10: 002980.
. 2005. Reduction of myeloid-derived suppressor cells and induction of M1 macrophages facilitate the rejection of established metastatic disease. J. Immunol. 174: 636–645.
. 2014. HMGB1 enhances immune suppression by facilitating the differentiation and suppressive activity of myeloid-derived suppressor cells. Cancer Res. 74: 5723–5733.
. 2013. Myeloid-derived suppressor cell function is reduced by Withaferin A, a potent and abundant component of Withania somnifera root extract. Cancer Immunol. Immunother. 62: 1663–1673.
. 2014. Cross-talk among myeloid-derived suppressor cells, macrophages, and tumor cells impacts the inflammatory milieu of solid tumors. J. Leukoc. Biol. 96: 1109–1118.
. 2012. Accumulation of p62/SQSTM1 is associated with poor prognosis in patients with lung adenocarcinoma. Cancer Sci. 103: 760–766.
. 2008. Genetic alteration of Keap1 confers constitutive Nrf2 activation and resistance to chemotherapy in gallbladder cancer. Gastroenterology 135: 1358–1368, 1368.e1–1368.e4.
. 2008. Cancer related mutations in NRF2 impair its recognition by Keap1-Cul3 E3 ligase and promote malignancy. Proc. Natl. Acad. Sci. USA 105: 13568–13573.
. 2008. RNAi-mediated silencing of nuclear factor erythroid-2-related factor 2 gene expression in non-small cell lung cancer inhibits tumor growth and increases efficacy of chemotherapy. Cancer Res. 68: 7975–7984.
. 2010. Nrf2 and Keap1 abnormalities in non-small cell lung carcinoma and association with clinicopathologic features. Clin. Cancer Res. 16: 3743–3753.
. 2004. Identification of polymorphisms in the promoter region of the human NRF2 gene. Biochem. Biophys. Res. Commun. 321: 72–79.
. 2002. Sulforaphane inhibits extracellular, intracellular, and antibiotic-resistant strains of Helicobacter pylori and prevents benzo[a]pyrene-induced stomach tumors. Proc. Natl. Acad. Sci. USA 99: 7610–7615.
. 2008. Increased susceptibility of Nrf2 knockout mice to colitis-associated colorectal cancer. Cancer Prev. Res. (Phila.) 1: 187–191.
. 2007. Increased colonic inflammatory injury and formation of aberrant crypt foci in Nrf2-deficient mice upon dextran sulfate treatment. Int. J. Cancer 121: 1883–1891.
. 2013. Regulatory nexus of synthesis and degradation deciphers cellular Nrf2 expression levels. Mol. Cell. Biol. 33: 2402–2412.
. 2006. Inhibition of 7,12-dimethylbenz(a)anthracene-induced skin tumorigenesis in C57BL/6 mice by sulforaphane is mediated by nuclear factor E2-related factor 2. Cancer Res. 66: 8293–8296.
. 2002. Myeloid suppressor lines inhibit T cell responses by an NO-dependent mechanism. J. Immunol. 168: 689–695.
. 2004. Arginase I production in the tumor microenvironment by mature myeloid cells inhibits T-cell receptor expression and antigen-specific T-cell responses. Cancer Res. 64: 5839–5849.
. 2010. Myeloid-derived suppressor cells inhibit T-cell activation by depleting cystine and cysteine. Cancer Res. 70: 68–77.
. 2009. Inflammation enhances myeloid-derived suppressor cell cross-talk by signaling through Toll-like receptor 4. J. Leukoc. Biol. 85: 996–1004.
. 2012. Coordinated regulation of myeloid cells by tumours. Nat. Rev. Immunol. 12: 253–268.
. 2012. Monocytic CCR2+ myeloid-derived suppressor cells promote immune escape by limiting activated CD8 T-cell infiltration into the tumor microenvironment. Cancer Res. 72: 876–886.
. 2013. Nrf2 regulates haematopoietic stem cell function. Nat. Cell Biol. 15: 309–316.
. 2014. ER stress regulates myeloid-derived suppressor cell fate through TRAIL-R-mediated apoptosis. J. Clin. Invest. 124: 2626–2639.
. 2009. Myeloid-derived suppressor cells: linking inflammation and cancer. J. Immunol. 182: 4499–4506.
. 2015. Myeloid-derived suppressor cells: critical cells driving immune suppression in the tumor microenvironment. Adv. Cancer Res. 128: 95–139.
. 2011. CpG blocks immunosuppression by myeloid-derived suppressor cells in tumor-bearing mice. Clin. Cancer Res. 17: 1765–1775.
. 2013. Therapeutic regulation of myeloid-derived suppressor cells and immune response to cancer vaccine in patients with extensive stage small cell lung cancer. Cancer Immunol. Immunother. 62: 909–918.
. 2014. Effects of notch signaling on regulation of myeloid cell differentiation in cancer. Cancer Res. 74: 141–152.
. 2000. Vitamin D3 treatment to diminish the levels of immune suppressive CD34+ cells increases the effectiveness of adoptive immunotherapy. J. Immunother. 23: 115–124.
. 2007. Identification of retinoic acid as an inhibitor of transcription factor Nrf2 through activation of retinoic acid receptor α. Proc. Natl. Acad. Sci. USA 104: 19589–19594.
. 2013. Nuclear factor-erythroid 2 (NF-E2) p45-related factor-2 (Nrf2) modulates dendritic cell immune function through regulation of p38 MAPK-cAMP-responsive element binding protein/activating transcription factor 1 signaling. J. Biol. Chem. 288: 22281–22288.
. 2013. The emerging role of the Nrf2-Keap1 signaling pathway in cancer. Genes Dev. 27: 2179–2191.